“Unfortunately, we can’t control the weather. And your safety is our first priority.” Each canceled flight ended with this apology. My husband and I took the news in stride when we heard that our flight would leave two hours late. We put our names on a waiting list for the only restaurant with seating on our concourse and texted our kids in Denver and Baltimore to update them. I’m not a fan of flying, so I was happy to have the flight diverted and late rather than to fly out of Denver with the danger of hail, lightning, and wind shear—all serious enough threats to close the entire airport for more than an hour. When our names were called at the restaurant, my husband checked at the gate to see if we had time to eat. The ticket agent told him apologetically that it now appeared the flight would be four hours late. We accepted the table and ordered a meal to share, a beer for him, and a glass of wine for me. We watched as weary travelers whose flights had been canceled lined up to rebook. Some, traveling alone, left the line and came to the bar instead, ordering up drinks and laughing with their fellow stranded travelers. Parents of young children looked harried as they tried to stay in line while their toddlers darted away from them. Everyone looked tired. My husband and I felt fortunate that this was happening on the return trip instead of on the trip out, when we had our six-year-old grandson with us. We finished our dinner and decided to go to the additional seating on the second floor, which few passengers had found. Most were teenagers who had commandeered the few available electrical outlets to plug in their phones and tablets. 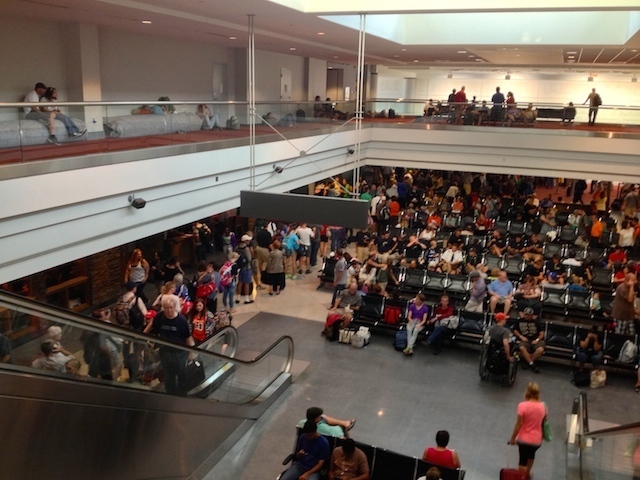 My husband and I sat overlooking the concourse as more passengers heard the bad news. Tempers were rising, and one woman spewed venom at the ticket agent unlucky enough to say to her, “Next customer, please.” We shook our heads and pulled out our eReaders, still hopeful that our flight would not be canceled. After five hours at the airport, we got the news—our flight was still in Salt Lake City and would remain grounded there—no more flights to Baltimore until the next day. Southwest had overbooked our flight to begin with, and passengers scrambled to line up as the ticket agent announced the number to call to rebook by phone. No flights would be rebooked online, she said, causing a cacophony of protest from tech-savvy tourists who hardly remembered how to do business by phone. My husband called the number to find that the wait for an agent would be about 50 minutes. Unlike the many travelers who were in Denver for connections to other cities, we were lucky to have family there. My stepson arranged for a shuttle to bring us halfway to his home, and he picked us up so that we could go back and sleep in the same bed we’d slept in the night before. There was only one problem: Our checked bags were not retrievable and would be sent to Baltimore on the first flight the next morning. Surprised to find a department store open at almost 10:00 on a Saturday, we stopped to buy a change of clothing, toiletries, and make-up for me. We have enjoyed a quiet morning of sitting on the deck, looking at the mountains in the distance, and squeezing in a wee bit more time with our loved ones. The sky is cloudy, and we hear thunder rumbling in the distance. The forecast tells us, though, that we won’t have a repeat of the pea-size hail that battered the deck nor the lightning that grounded the planes the day before. If we do? We can’t control the weather—trite but true. But in the meantime, I’m thankful for a daughter in Maryland who cheerfully adjusted her plans to take care of the dog that my husband laughingly calls her brother. I’m thankful for a stepson, a daughter-in-law, and a grandson who were happy to hug us hello last night and who will be a little sad to repeat the goodbye again this evening. There is much in this life that we can’t control—no matter how hard we try. Flights get canceled. And no matter how good we are as parents, there are no guarantees that our children will become adults who want us in their lives and who come to our aid when we need them. My husband and I are fortunate indeed. I love my life. And that helps me put the inconvenience of stormy weather into perspective, though I still hope for traveling mercies as we return to the airport this evening. Tell me a story. How do you make it through the storms? Previous PostCan You Get Help When You’re Sick?Next PostHow Does the Media Shape Our Views of Race? Love, love, love your stories. Reminds me of a modern day Walton.